Join us for this unparalleled and comprehensive nine-day Aegean odyssey to the very cradle of Western civilization and the classical world. Cruise around Athens, Greece, aboard the exclusively chartered, newest Five-Star small ship Le Bougainville. 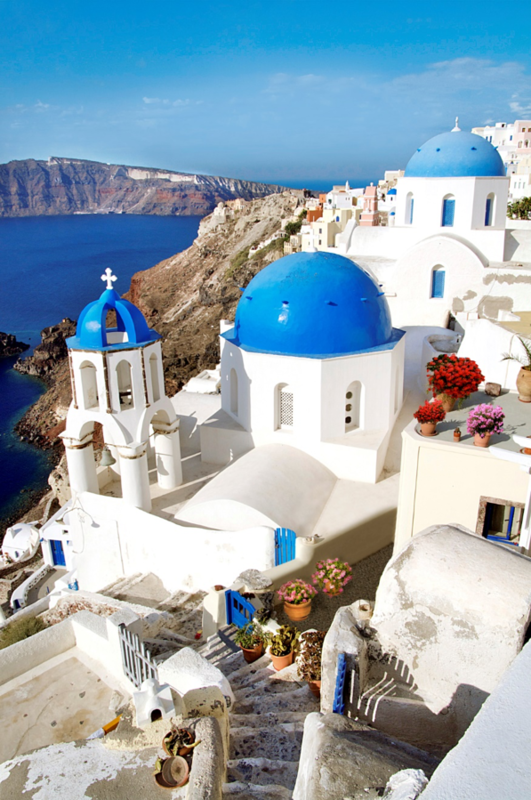 Call on the islands of Delos, Mykonos, Pátmos, Rhodes and Santorini, and the Peloponnese Peninsula. Visit the extraordinary wonder of Meteora, where 14th- and 15th-century monasteries stand high atop soaring natural sandstone pinnacles, and walk through legendary sites of antiquity—including the ancient citadel of Mycenae and historic Epidaurus. Enjoy guided tours in these storied destinations, free time to encounter their mysteries and delights at your own pace during the best time of the year, and opportunities to visit seven magnificent UNESCO World Heritage sites. Meet local residents during the specially arranged Island Life® Forum for a personal perspective on the true character of the Aegean Sea’s maritime culture. Extend your voyage with the Athens Pre-Cruise Option and the Ancient Olympia Post-Cruise Option. Unparalleled and comprehensive Aegean Odyssey exploring iconic jewels and legendary, mythical places. Exclusively chartered, seven-night cruise aboard the newest Five-Star small ship Le Bougainville, launching in 2019, accessing ports unavailable to larger vessels. Only 92 Suites and Staterooms, all featuring a balcony, and access to ports unavailable to larger vessels. Exclusive Island LifeÒ Forum for interaction with locals. Visit up to nine UNESCO World Heritage sites. Call on island steeped in myth and history—Delos, Mykonos, Pátmos, Santorini and medieval Rhodes. 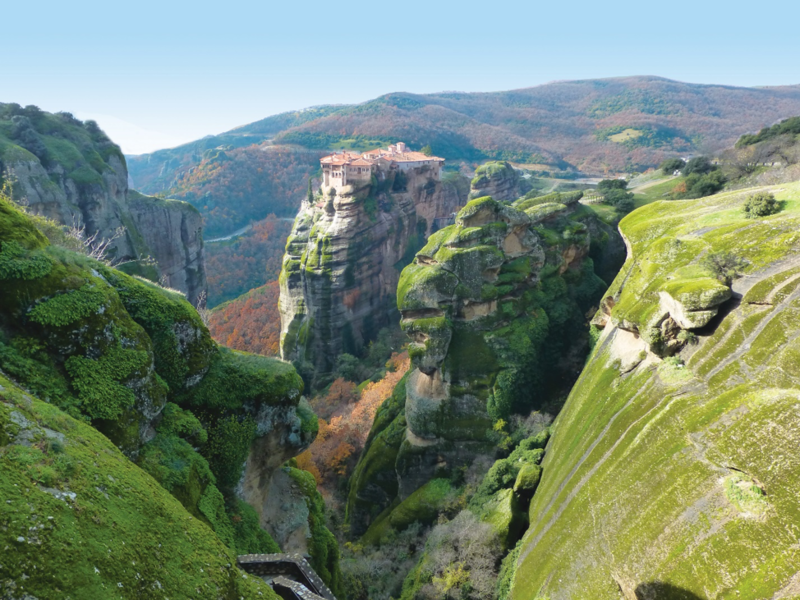 Visit extraordinary Meteora, where 24 Orthodox monasteries stand high atop natural sandstone pinnacles. Walk through the fabled Lion Gate of the legendary city of Mycenae. Explore the monumental ruins of the Sanctuary of Asklepios in historic Epidaurus. Athens Pre-Cruise and Ancient Olympia Post-Cruise Options. The Le Bougainville ushers in a new generation of Five-Star small ships, combining revolutionary design and a new standard of luxury for an unparalleled expedition cruising experience to be launched in 2019. Venture where no ships have gone before, remote destinations where authentic encounters with captivating cultures, spectacular wildlife and majestic scenery await you. Exclusive to the Ponant Explorer fleet is the extraordinary Blue Eye, a multisensory underwater observation lounge that incorporates bionic and biomimetic decor and technology to immerse you in the beauty of the ocean’s ecosystem. Observe marine life through the large subaquatic windows and on digital screens projecting undersea activity in real time, while specially designed hydrophones echo the ocean’s ebb and flow and relay the sounds and senses beneath the water’s surface. eco-friendly features that protect fragile marine ecosystems while providing a safe and comfortable voyage. Each Five-Star Stateroom and Suite (up to 484 square feet) features a private balcony. Grand Deluxe Suites have a bay window and spacious private terrace. Accommodations offer two twin beds or one queen bed, individual climate control and luxurious hotel amenities. Dine indoors or alfresco on international and regional cuisine served in the stylish, spacious indoor-outdoor restaurant, at the casual pool deck grill or from 24-hour room service. Daily meals include continental and buffet breakfasts, buffet lunch, afternoon tea and a four-course dinner. Inspired by the natural and nautical worlds, the warm and inviting public areas are marked by a refined elegance. Enjoy sweeping views from the lounges, which open to the outdoors, and lectures, cultural performances or film screenings in the state-of-the-art theater. Relax in the spa and sauna rooms or the Sun Deck’s infinity-style swimming pool. Each ship has a beauty salon, fitness room and, for your convenience, two elevators. Complimentary Wi-Fi is available throughout the ship. The highly trained, English-speaking crew are personable and attentive, and the ship has an infirmary staffed with a doctor and nurse. Insights from Aegean historian Eleni Zachariou. 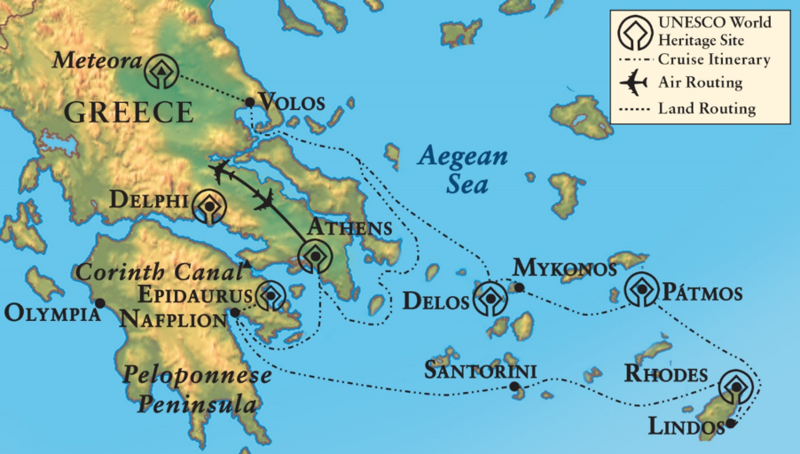 Seven-night cruise round trip Athens, Greece, with port calls at Volos for Meteora, Delos, Mykonos, Pátmos, Rhodes and Santorini; and Nafplion for Mycenae and Epidaurus. Blue Eye—the world’s first luxury, multisensory, underwater observatory. Excursion to the extraordinary UNESCO World Heritage site of Meteora, where 14th- and 15th-century Greek Orthodox monasteries sit atop towering natural sandstone pinnacles, with lunch. Walking tour of medieval Rhodes Town, a UNESCO World Heritage site, with a visit to the 14th‑century Palace of the Grand Masters of the Knights of St. John. Visit to the Acropolis of Lindos. Tour of the Cave of the Apocalypse and the Monastery of St. John, a UNESCO World Heritage site, on the island of Pátmos. Walking tour of UNESCO World Heritage‑designated Delos’ splendid classical ruins including the Sanctuary of Apollo and the theater quarter. 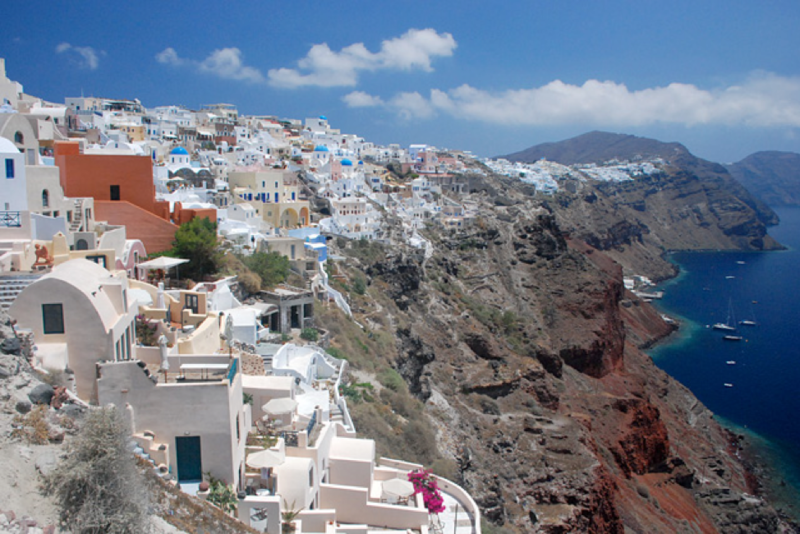 Tour of Santorini, featuring a visit to the renowned Museum of Prehistoric Thera and a cable car ride down from the hilltop town. Time at leisure to explore the islands of Mykonos and Pátmos. Guided tour of the phenomenal Minoan site of Bronze-Age Akrotiri on Santorini. Visit to Mycenae, a UNESCO World Heritage site and the “well-founded citadel” described in Homer’s The Iliad. Excursion to Epidaurus, featuring the UNESCO World Heritage-designated Sanctuary of Asklepios and its perfectly preserved theater. Island Life® Forum with local residents who will discuss contemporary life on the ancient islands of the Aegean Sea. Traditional Greek music and dance performance. Special culinary presentation given by the ship’s pastry chef. Experienced Gohagan & Company Program Directors at your service. 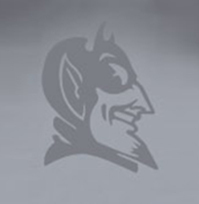 All Included Features are contingent upon final brochure pricing. Experience the ancient city unmatched in its contributions to the foundations of the Western world—Athens, the birthplace of democracy. Explore the enduring grandeur encapsulated in the spectacular Acropolis, a UNESCO World Heritage site, and the gracefully proportioned Parthenon, a perfect example of Doric architecture, dedicated to the goddess Athena in 438 B.C. 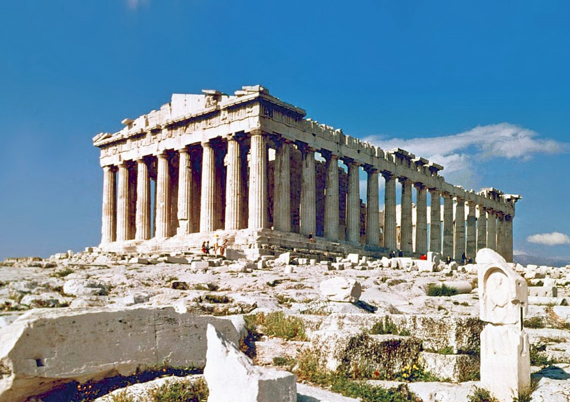 See the archaeological treasures of the Acropolis Museum and tour the hallowed ruins of the UNESCO World Heritage-designated Delphi, the ancient sacred site where Ancient Greeks of all classes sought divine advice on matters as routine as farming and as monumental as the declaration of war. This Pre-Cruise Option features two nights in the deluxe Athenaeum InterContinental Athens Hotel, Athens. Journey to UNESCO World Heritage-designated Olympia, ancient center of worship and the Temple of Zeus. Nearby Vytina, nestled among chestnut trees and old pines, is a significant Greek cultural heritage “traditional settlement.” Enjoy distinctive local cuisine and explore regional traditions in the Folklore Museum. Visit the original sixth‑century B.C. stadium and Bouleuterion, where competitors swore their oath to uphold Olympic game standards. Learn more about one of the world’s greatest mathematicians in Archimedes’ Museum. Board a small excursion boat and cruise through the fabled Corinth Canal, an engineering marvel and scarcely 70 feet wide at its narrowest point. Accommodations are for two nights in the charming Amalia Olympia and one night in the Sofitel Athens Airport Hotel. Pre-Cruise and Post-Cruise Options are available at additional cost. Details will be provided with your reservation confirmation.